SARATOGA SPRINGS, N.Y.–Hall of Famer Rachel Alexandra (Medaglia d’Oro) achieved one of her career highlights at Saratoga when defeating older males in the 2009 GI Woodward S., after which she was named both Horse of the Year and champion 3-year-old filly. Both of her foals starred at Saratoga in 2015, starting with Rachel’s Valentina (Bernardini)’s “TDN Rising Star” worthy debut win Aug. 2 of that year, which she followed up with a victory in the GI Spinaway S. Her year-older half-brother Jess’s Dream was also named a “TDN Rising Star” for an impressive last-to-first graduation at first asking Aug. 24, 2015, which would be the only start of his career. On Saturday, Rachel Alexandra’s half-brother Fayeq (Malibu Moon) will look to continue the family legacy at Saratoga when he lines up for the GI Travers S.
Third behind “TDN Rising Star” and GIII Pegasus S. winner Timeline (Hard Spun) on debut sprinting at Gulfstream Mar. 4, Fayeq checked in fifth behind a “TDN Rising Star” performance from Time to Travel (Hard Spun) in Hallandale Apr. 1. 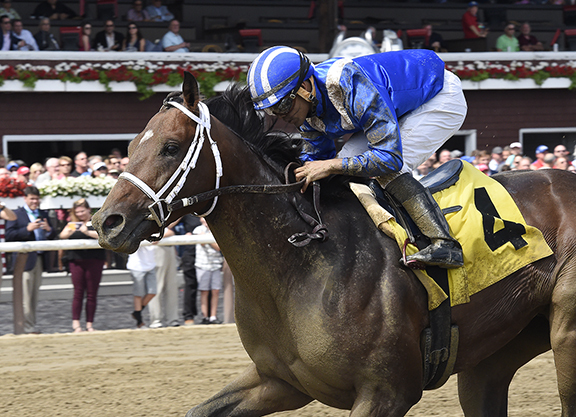 The $800,000 KEESEP yearling relished this extension in trip when routing for the first time at Belmont, earning his diploma by 2 3/4 lengths June 11, and followed suit with a decisive first-level allowance victory going nine panels at the Spa July 26 (video). The Shadwell Stable representative takes a big jump up in class Saturday, where he will face the winners of all three Triple Crown races, as well as, the GI Haskell Invitational S. top two finishers. 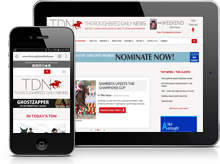 McLaughlin will saddle another 3-year-old Grade I contender for Shadwell Saturday in “TDN Rising Star” Takaful (Bernardini), who is scheduled to run in the GI H. Allen Jerkens Memorial S. (formerly the King’s Bishop). The dark bay was last seen romping by 5 1/4 lengths in an allowance here on opening day July 21 (video) and has been training well at Belmont since. Takaful has a reputation of being a bit of a handful, so McLaughlin sent him back to continue his training at Belmont, where he seems the most comfortable. “He is just training better there and is doing so well from there, so I didn’t want to change anything,” the conditioner said. McLaughlin also sends out Godolphin homebred Dickinson (Medaglia d’Oro) in Saturday’s GII Ballston Spa S. Besting Lady Eli (Divine Park) by a head in the GI Coolmore Jenny Wiley S. this spring (video), she checked in fifth behind that rival in the GI Diana S. July 21.